German police have detained the former Catalan president Carles Puigdemont under a European arrest warrant as he crossed from Denmark into Germany. Puigdemont, who has been living in self-imposed exile in Brussels since October, was travelling in a car on the way from Finland to Belgium on Sunday when he was detained, having visited Finnish lawmakers in Helsinki. On Friday the Spanish government reactivated an international arrest warrant for Puigdemont, who is wanted on charges of sedition, rebellion and misuse of public funds. Spain sent a request to the Finnish authorities to detain Puigdemont, who was on a visit to promote the Catalan independence cause. However, the request was written in Spanish and there was a delay while authorities in Madrid had it translated into English. In the meantime, Puigdemont left the country. Ralph Döpper, a deputy general attorney at the state prosecutor in Schleswig-Holstein, told the Guardian he was currently investigating whether Puigdemont would be placed into extradition custody, and he would announce his preliminary findings on Monday morning. On Sunday afternoon Puigdemont was transferred to Neumünster prison in northern Schlewig-Holstein. Citing “rumours within judicial circles”, the local newspaper Kieler Nachrichten reported that Puigdemont was considering applying for asylum in Germany. The paper added that the chances of an asylum application overriding the European arrest warrant were relatively slim. News of the arrest sparked protests in Barcelona that turned violent, with three arrests and at least 52 people injured. A crowd of several thousand people gathered outside the office of the European commission chanting “no more repression” and “general strike”. They later made their way to demonstrate outside the German consulate. There were also traffic go-slows on several main roads. While the main demonstration passed off peacefully, several hundred protestors tried to break through police cordons around the seat of the Spanish government in the city. They were beaten back by baton charges. There were also demonstrations in all four of Catalonia’s provincial capitals and major roads were blocked by sit-down protests amid a growing sense that the era of peaceful pro-independence demonstrations is over, despite appeals from the main secessionist parties for calm. Puigdemont had covered 808 miles (1,300km) of the 1,243-mile car journey when he was stopped at 11.19am, apparently at a petrol station near Schuby on the A7 motorway, 31 miles into German territory, according to his lawyer, Jaume Alonso-Cuevillas. According to German media reports, the arrest was made following a tipoff from Spain’s intelligence agency to German federal police’s Sirene bureau, part of a network of information-sharing units for national police in the Schengen area. Puigdemont could face up to 25 years in prison in Spain if convicted of charges of rebellion and sedition for organising an illegal referendum for Catalonia that led to a unilateral declaration of independence in October. According to the rules of the European arrest warrant, Germany has up to 60 days to decide whether to extradite him to Spain. 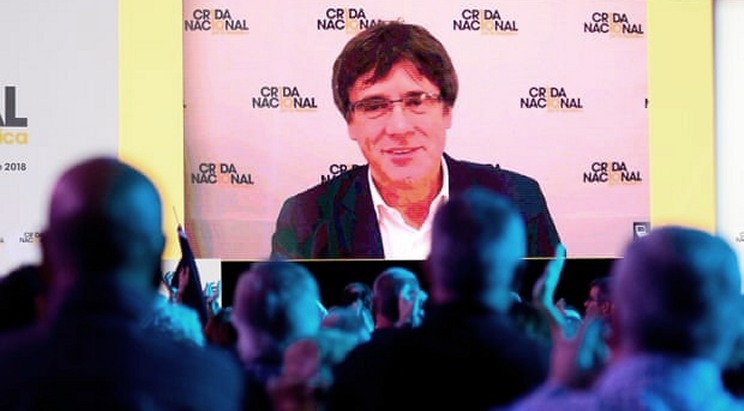 If Puigdemont surrenders to be prosecuted, the decision must be made within 10 days. The international warrant, originally issued in November, was rescinded in December amid Spanish concerns that Belgium would not extradite Puigdemont for the more serious charges against him as they are not on the Belgian statute books. Were he to be extradited only on the lesser charge of misuse of public funds, he could be tried only for that offence. Germany can extradite suspects only if the alleged offence is also punishable under German law. There is no such crime as rebellion under German law, but there is a crime of high treason, defined as using force or the threat of force to undermine the constitutional order. The Catalan unilateral declaration of independence was entirely peaceful, if unlawful, although Spanish authorities may argue there was an implicit threat of force. The crime of sedition was dropped from German law in the 1970s. The arrest warrant was reactivated on Friday, as were similar warrants for other Catalan fugitives – Lluís Puig, Meritxell Serret and Toni Comín, who are all in Belgium, and Clara Ponsati, currently in Scotland where she is teaching at the University of St Andrews. Authorities in Scotland confirmed they had received the warrant, and Ponsati was said to be negotiating to turn herself in to police. Warrants were also issued for the arrest of Marta Rovira, secretary general of the secessionist Republican Left party, and Anna Gabriel, of the radical Popular Unity Candidacy, both of whom have sought refuge in Switzerland. On Friday a Spanish supreme court judge remanded in custody Jordi Turull, the third and latest candidate for the vacant Catalan presidency, and four others, among them a former speaker of the Catalan parliament. They join Oriol Junqueras, leader of Republican Left, and three others already held on remand in Madrid jails. and a lot of support. Orban said the European parliamentary vote must prove that there was an alternative to liberal democracy, which he said worked in undemocratic ways in Western Europe by being intolerant of alternative views. 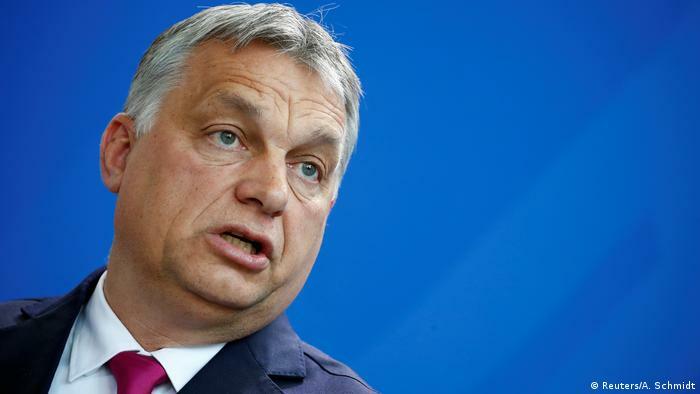 “Christian democracy is not liberal...It is illiberal, if you like,” Orban said. Unlike liberal democracy, he said, Christian democracy rejects multiculturalism and immigration while being anti-communist and standing for Christian values. 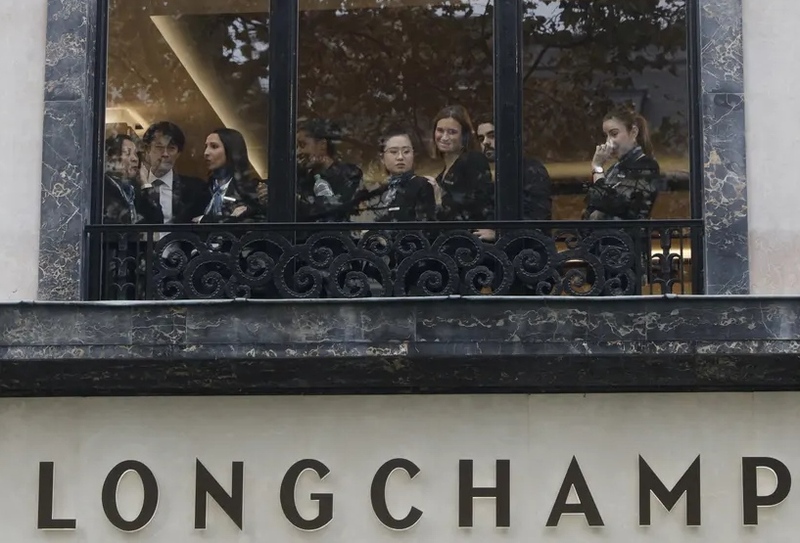 “We are facing a big moment: we are saying goodbye not simply to liberal democracy ... but to the 1968 elite,” he said, alluding to an international wave of leftist, liberal protest that upended the ruling conservative order in many countries. This sounds hopeful but there will be no real change until each nation reclaims it's own sovereignty by issuing it's own money...money that has not been borrowed at interest from private banks. I say RIGHT ON Hungary and Thank God for Hungary. The usury banking criminals(who control Brussels and own the ECB) want the immigrants because they are debt-free and can be turned into future debt-slaves, also governments must borrow huge amounts from the usury bankers to pay for the immigrants, more profits for the usury bankers. Also the immigrants will be forced to pay interest on these exponentially growing public debts, paying interest to the usury bankers of course. It is necessary to keep the criminally insane debt-based 'money creation' scheme going. The usury banking satanists (aka ECB) who control the EU can not stand the fact that the Poles, and we presume the Hungarians, are devout Catholics, or that they remember life under the USSR and they are fully aware that the EU is developing into something even worse. The usury banking satanists want one world government controlled by the central banks (or A central bank) and policed by the UN, NATO and and and..........A EUROPEAN ARMY|!!!!!!! as part of a new bid to rally separatists from his base in Belgium. A Dutch friend suggests another, and more truthful, reason why the bankers, for whom Macron seems to be the prime Euro stooge, want a "European Army"
"........but what they want with a European army is keep the EU together with military force"
its highest point since the early 2000s. 2.9 cents on petrol on 1 January 2019 was seen as the final straw. 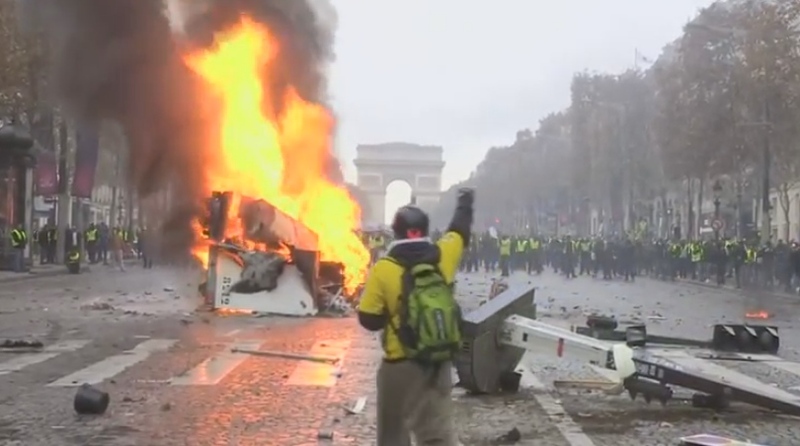 Tear gas and a water cannon were deployed in Paris as protesters again flooded the streets against fuel prices hikes. 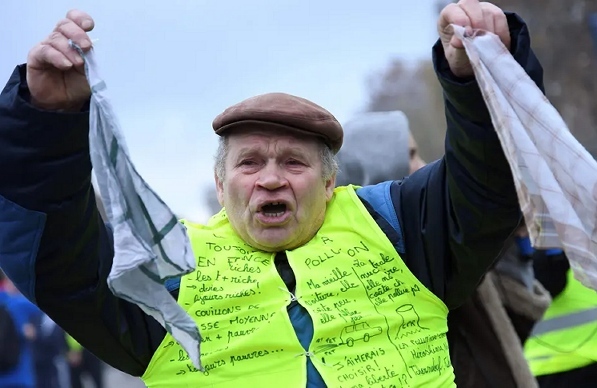 Thousands have been protesting across France against the measure, which resulted in massive blockades. The tense standoff between riot police and demonstrators – some of them masked – escalated as law enforcement were pelted with bottles. Police fired back with tear gas and water cannon spay. 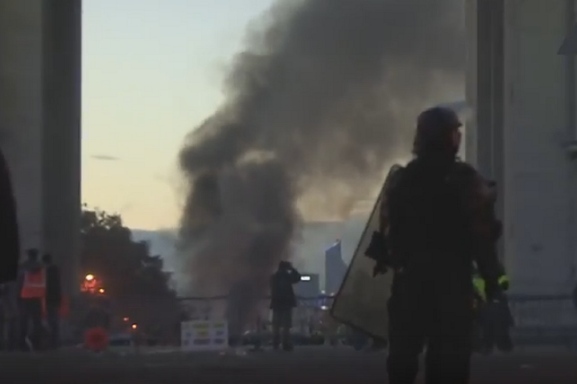 At one point the city center resembled a battlefield, covered with smoke and what remained of the barricades, which were set up from fences and trash bins. Possible smoke grenades were also used as people walked past the smoking projectiles. RT’s correspondent Charlotte Dubenskij has been caught in the midst of the rally and is giving more updates as the demonstration progresses. AP footage also showed one of the protesters being dragged away by police in riot gear. Saturday marks the second week in a row that protests have been held in the French capital and across the country. Some 3,000 security personnel have been deployed to deal with the rally in the city alone. 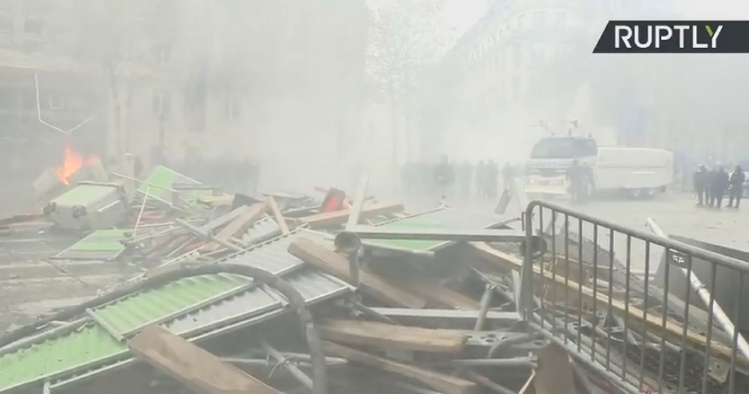 One of the videos from the unrest shows demonstrators chanting behind the improvised barricades before being forced to retreat as they were smashed by thick sprays from the water cannon. The unease has been spurred on by rising fuel prices and a planned fuel tax. 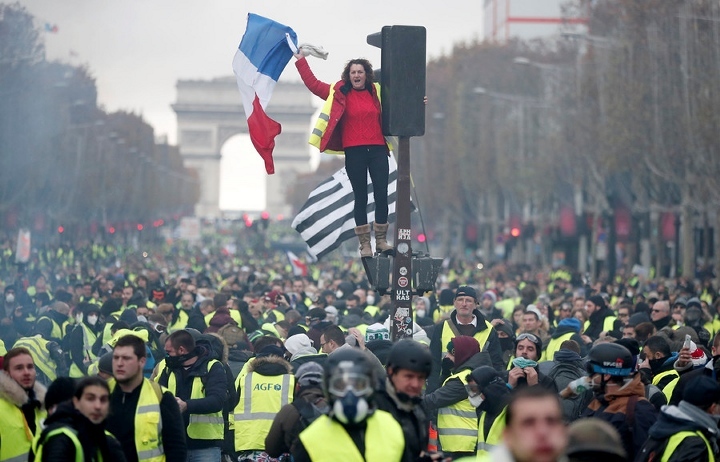 The ‘Yellow Vest’ movement, as it’s called, is protesting the measure which is due to be in place from January 1, 2019. The government claims the move is aimed at promoting environmentally friendly practices. However, that has been met with a fierce response from the public. set a fire. 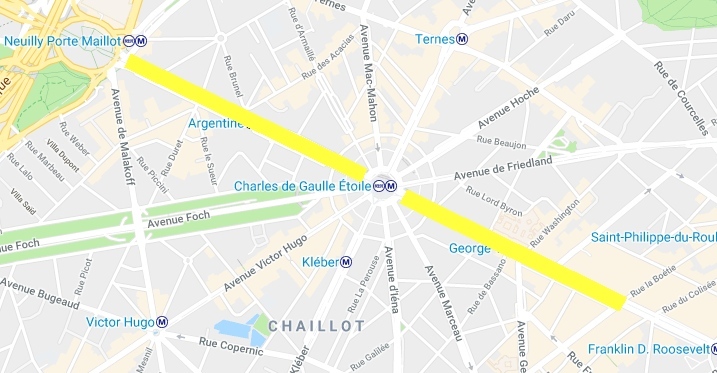 They now control the Champs Elysses. as police attempt to clear the street. colleagues are still fighting police around the Arch de T.
make it impossible for the police trucks to get near them. who began the protest earlier. into a general expression of pissed-off-ness against globalists. to try clear the Champs and the police are in a holding mode. They voted for Macron and now they don't like what they well should have known they would get? Weird. They're the kind of people who voted for Macron. Anyway, now half of those who did vote Macron know they were conned. When you gonna cut your losses? Before things get to the guillotine stage? protest control overnight. If so we are in a new game. any chance of them now clearing the street before dark. are blocked, Metro stations closed. 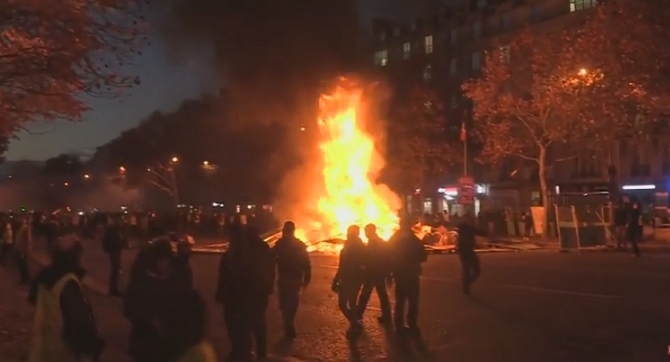 This is one of the largest uprisings France has seen for years. Smoke from the fire on the Champs rises thru the Arch de T.
Below is the fire being stoked with more burnable material. North of the Arch the protesters there have suddenly just withdrawn. not going to see overnight occupation. claimed, from North of the arch to midway down the Champs. Anybody else for carbon taxes? Come on you green politicians, save the planet, ffs. and the green agenda's high moral ground meet the actual road. 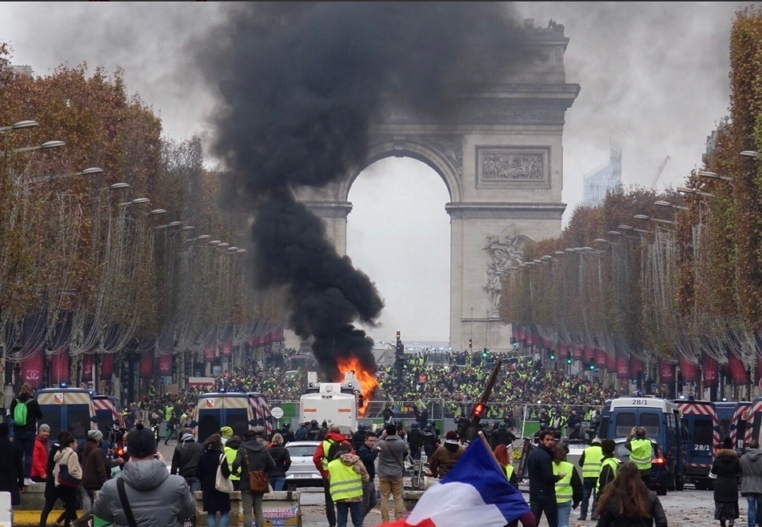 So..... will Macron go ahead with the carbon taxes in January? After all, this today was just a reaction to the threat of rises. will be asking themselves hard questions about global warming.